Acer TravelMate P6 series has been upgraded with a new model, called the TravelMate P614-51. The young entrant comes as a durable commercial Windows 10 Pro notebook. It is touted to deliver up to 20 hours of battery life and comes with a magnesium-aluminium alloy chassis that is claimed to be stronger and lighter than standard aluminium alloys. Weighing 1.1kg, the TravelMate P614-51 has 16.6mm of thickness. Acer at its [email protected] event in New York also unveiled the new Predator Orion 5000 desktop PC and new 43-inch Predator monitor with 4K resolution and 144Hz refresh rate – specifically targeted at computer gamers. The Taiwanese company also brought the various Predator line of gaming gadgets, including Cestus 330 mouse, Galea 311 audio headset, Aethon 300 keyboard, and an M-Utility backpack. The Acer TravelMate P614-51 durable notebook is set to go on sale in the US and EMEA in June with a starting price of $1,149.99 (roughly Rs. 79,300) or EUR 1,249 (roughly Rs. 97,000). The Predator Orion 5000 gaming desktop will go on sale in the US later this month with a starting price of $1,199.99 (roughly Rs. 82,800) and in EMEA in June starting at EUR 1,999 (roughly Rs. 1,55,200). The Predator CG437K P gaming monitor will be available in the US and EMEA both in September with a starting price of $1,299 (roughly Rs. 89,600) or EUR 1,499 (roughly Rs. 1,16,400). The Predator M-Utility Backpack will be available in the US and EMEA in June at $179.99 (roughly Rs. 12,400) or EUR 179 (roughly Rs. 13,900). Similarly, the Predator Cestus 330 gaming mouse will be available in the US and EMEA in June at $69.99 (roughly Rs. 4,800) or EUR 79 (roughly Rs. 6,100). The Predator Aethon 300 gaming keyboard will also go on sale in June at $119.99 (roughly Rs. 8,300) or EUR 149 (roughly Rs. 11,600). Lastly, the Predator Galea 311 gaming headset will be available in the US and EMEA in June at $99.99 (roughly Rs. 6,900) or EUR 69 (roughly Rs. 5,300). To make it an attractive option for enterprise customers, the Acer TravelMate P614-51 includes biometric fingerprint authentication and an IR camera with Windows Hello support. The notebook features a 14-inch full-HD (1920×1080 pixels) IPS display along with 170-degree wide viewing angles. Also, it comes with a full-sized, backlit keyboard and has a Corning Gorilla Glass NBT touchpad with gesture support. The notebook also comes with a 180-degree hinge design that enables it to lay flat. Under the hood, the Acer TravelMate P614-51 has up to eighth-generation Intel Core i7 processor, along with up to 24GB DDR4 RAM, up to Nvidia GeForce MX250 graphics. There is also up to 1TB of Gen 3 x4 PCIe SSD based on NVMe technology. The TravelMate P614-51 is a Skype for Business-certified machine and comes with a four-mic array. This is touted to pick up vocals from up to 6.5 feet away. The notebook also has eSIM support for 4G LTE connectivity as well as 802.11ac 2×2 MU-MIMO technology. Acer has provided NFC support and a microSD card slot on the TravelMate P614-51. Additionally, there is Intel Thunderbolt 3 support. Coming towards the security features, the TravelMate P614-51 works with Windows Hello via the fingerprint reader available on its power button. There is also an IR webcam that works with biometric facial recognition. The TravelMate P614-51 comes preloaded with Acer ProShield and Acer Office Management tools to safeguard sensitive data and let IT professionals deploy security policies and remotely monitor assets. Furthermore, the notebook sports an integrated Trusted Platform Module (TPM) 2.0 chip that is claimed to provide hardware-based protection for passwords and encryption keys and an Intel vPro to add another layer of protection. In addition to the TravelMate P614-51, Acer has unveiled the new Predator Orion 5000 desktop PC. 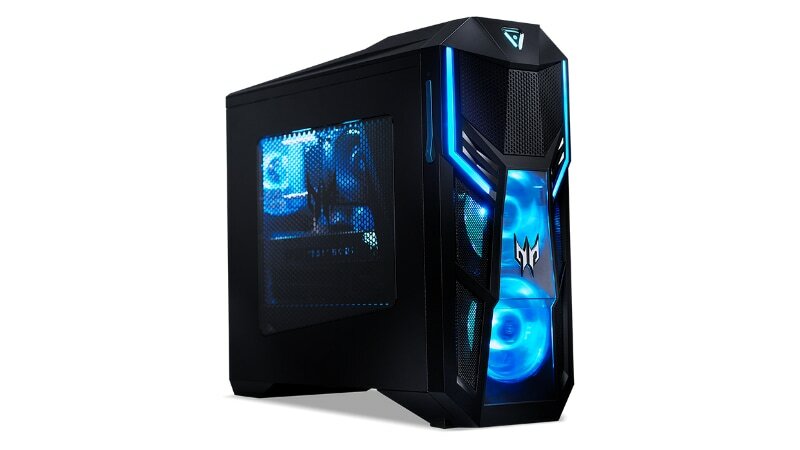 It is powered by an overclockable octa-core ninth-generation Intel Core i9-9900K on top of Z390 chipset, along with dual-channel DDR4 RAM (up to 64GB). There is also an Nvidia GeForce RTX 2080 GPU. Moreover, the desktop comes with a Cooler Master CPU Liquid Cooler. Acer has provided a 30 litres chassis along with see-through side panel that includes a layer of metal mesh. The desktop also has an Easy-Swap expansion bay with support for 2.5-inch form factor SATA I/II/III SSD and HDD drives. Further, there is support for 2.5Gbps Ethernet. To please gamers with multi-coloured patterns, the new Predator Orion 5000 desktop has an RGB lighting pattern. Acer says that light bars and case fans tucked away within the hardened shell to ultimately support 16.7 million colours. Moreover, gamers can fine-tune lighting using the Lighting Maker. 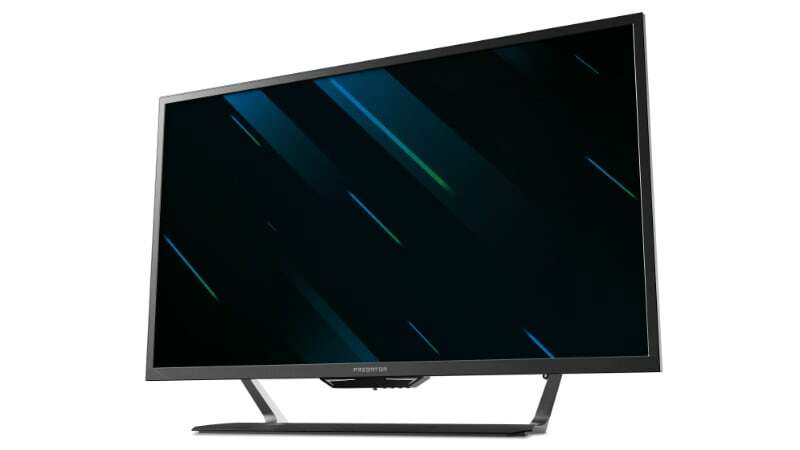 Acer also launched the Predator 43-inch LFGD (Large format gaming display) gaming monitor with model number CG437K P that arrives as a companion to the Orion 5000 desktop. The monitor has a 4K UHD (3840×2160 pixels) resolution and 144Hz refresh rate. Also, there is an AdaptiveSync feature that is touted to adapt the frame rate of the outputting device. The VA display panel of the latest Predator LFGD monitor CG437K P has a wide colour gamut of 90 percent of the DCI-P3 colour space. There is also VESA-Certified DisplayHDR 1000 certification. For console gamers, the monitor has three HDMI ports as well as a USB Type-C and a DisplayPort. Acer has provided a light sensor on the Predator monitor for power saving. Similarly, there is a proximity sensor that wakes up the screen from standby mode when viewers move the front of the monitor or revert to the sleep mode when no movement is detected. There is also a remote control. In addition to the desktop and monitor, Acer’s Predator range has got the Predator M-Utility Backpack that is designed for gamers, streamers, and photographers with a water-repellent design. The Backpack is compatible with up to 17-inch laptop. There is also the Predator Cestus 330 gaming mouse sporting 16,000 DPI and seven programmable buttons. Acer has also added the Predator Aethon 300 gaming keyboard to its bouquet with Cherry switches (MX Blue), teal blue backlighting, and anti-ghosting on all keys. Besides, there is the Predator Galea 311 foldable gaming headset with 50mm drivers support Acer’s TrueHarmony, hard key mutable micro, and a 3.5mm headphone jack connector. Andhra Pradesh Inter Results Declared: What’s Next?